Since 1964, Tom Dicktakes has spent at least part of each day working in his one-and-a-half car garage in a quiet East Sacramento neighborhood. Now in his seventies, the longtime Land Park groundskeeper and former baseball player for the semi-pro Sacramento Smokies (the “Tom A. Dicktakes Field” in Land Park is named in his honor) is retired from his city job. But Dicktakes has never retired from what is truly his life’s work: building a top fuel dragster of his own design. Much like Burt Munro, the obsessive Australian motorcycle racer whose life was depicted in the movie The World’s Fastest Indian, Dicktakes has focused relentlessly on making his dream a reality. A lifelong bachelor, he has forgone the creature comforts in life. He doesn’t go out to eat; he hasn’t taken a vacation in decades. 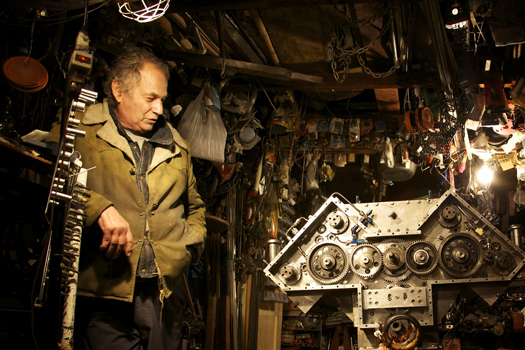 Instead, Dicktakes has worked every single day for the last 46 years on building and refining his engine and his dragster, and he’s done it with nothing more than a simple mill, metal lathe, and hand tools. Dicktakes has endured – and overcome – a steady stream of engineering problems, financial setbacks, catastrophic mechanical failures and the skepticism of his peers. While no racers would go on record, the common view is that Tommy is somewhat of a Don Quixote figure in the pantheon of top fuel dragsters. While many may not understand or would even belittle his sacrifice, Tom has found his purpose in life. It’s enough to make those of us who at middle age still don’t know what we want to be when we grow up, a little envious. 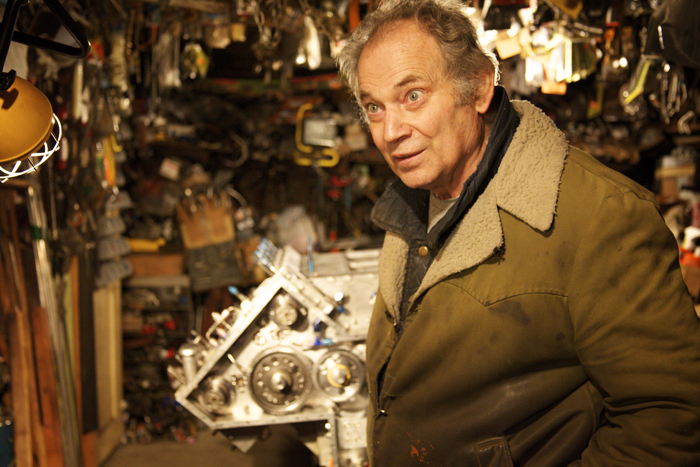 Dicktakes began building and racing hot rods in the fifties – one early example is slowly decaying next to his garage. Though he enjoyed driving, the engineering aspect of hot rodding soon became the focus of his interest, and with no more technical training than a high school mechanical drawing class, Dicktakes began to create his own original designs for racing parts. By 1964 he had come up with the genesis of the engine design that would dominate his thoughts for nearly the next half-century. Local drag racing began officially in 1954 when Bob Cress, a Stockton policeman who wanted to give kids a safe place to race helped set up the Kingdon drag strip on a surplus WWII airfield in Lodi. By the late ‘50s, Sacramento racers could venture out to the old fairgrounds on Stockton Boulevard where Don Tognotti ran a single lane, 1/8 mile strip between the horse barns. While there was no car-to-car racing, it was a straightforward deal – pop your hubcaps off, pay a quarter, and run your car all out from a standing start to have your car timed for bragging rights. Completely grassroots and DIY, early drag racing was the punk rock of motor sports. Backyard engineers built contraptions in their home garages that were faster than what the mega-budgets of the automobile companies could produce. In the mid-1960s, two regular guys with decent blue collar jobs could partner up and afford to build a supercharged, nitromethane-burning dragster (known as a top fuel dragster) in their home garage that would scarf up a ribbon of asphalt in 7 seconds at over 200 miles per hour. 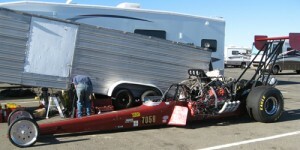 By the 1970s, drag racing had become a victim of its own success. The fuel-burning dragsters had gone from a local class run every week at every track across the country, to a professional class, racing on an exclusive national circuit while obtaining corporate sponsorships to foot the ever-increasing bill. By the 1980s, racing and development budgets totaled in the millions and independent tinkerers who wanted to design and build a top fuel dragster in their home garage were extinct. The “twin cam” moniker comes from the design of his engine. Where the Chrysler Hemi-style V8s used in modern top fuel dragsters use a single camshaft with pushrods in the center of the engine, Tom’s engine has a camshaft for each bank of valves – this results in two cams per cylinder head. With there being two cylinder heads on the engine, technically he should be called “Quad Cam Tommy” but no one argues with a nickname. The only other quad cam top fuel engine was developed in the 1980s by an Australian camshaft company named McGee. Though they started their project more than a decade after Dicktakes, they had the benefit of a large research and development budget and corporate-sponsored professional race teams to do all their testing. 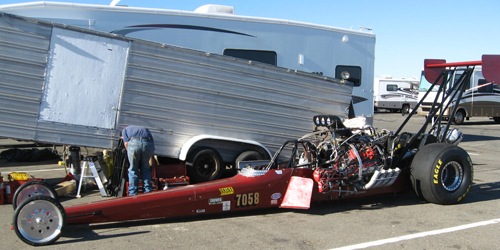 A top fuel dragster with a McGee engine set the track record at Sacramento Raceway in 1984. That record still stands. But the sport’s main governing body banned multi-cam top fuel engines in the mid-1990s, forcing McGee to pull the plug on their program. This has not stopped Dicktakes. He is simply driven to see his dream to completion and to reach his ultimate goal of reaching 300 miles per hour from a standing start at the end of a quarter mile sprint, breaking the record of the only other quad cam engine on the planet. So far he’s managed one run at 240 miles per hour, along with countless aborted attempts as mechanical weaknesses are exposed while doing duty in a homemade car engine that makes an estimated five-thousand horsepower. 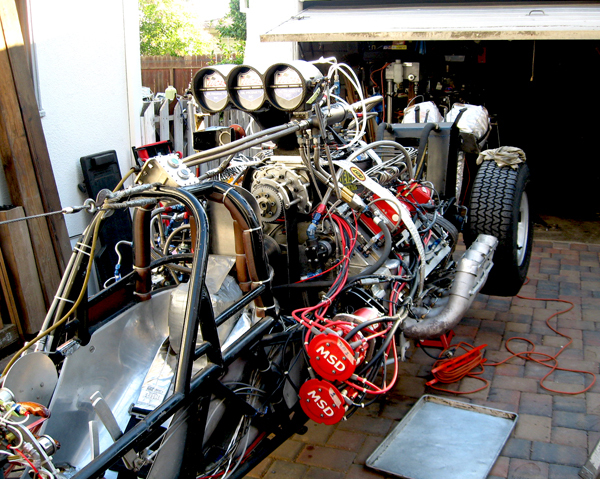 Nitromethane costs nearly $25 per gallon, and a single quarter mile run burns nearly 20 gallons of fuel; consequently, Twin Cam Tommy can only afford to test a couple of times a year – and that’s provided nothing major on the engine breaks, requiring months of redesigning, recreating, and reassembling. Despite the cost of fuel and the breaking parts, his biggest obstacle at this point in time, is time itself. Dicktakes knows he doesn’t have another 45-odd years to reach his goal. We should try to get a cheering section for tommy on sat. Ill be there most likely. really exited. Drag racing is full of guys trying to re invent the wheel. Awesome article about a man on a mission, no make that a nitro fueled quest! Nice to see some good old Canadian ingenuity.